Despite all of our binoculars and telescopes we didn’t spend all of our time at Minsmere looking upwards for birds! 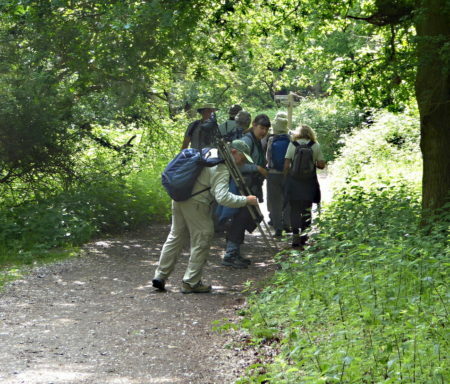 The reserve is also a special place for plants and many species of insects. It would have been a shame not to have seen some of these. 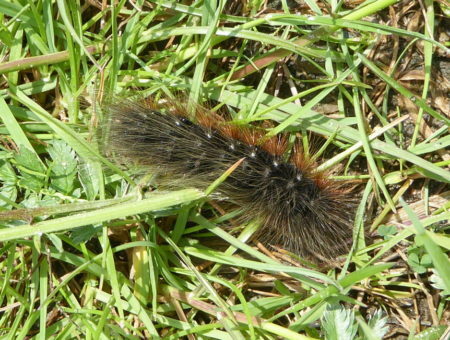 As Steve wrote in his report we found a very hairy caterpillar – but, in fact, we had a number of hairy moments as we walked around the reserve. Our first hairy find was this mating pair of ladybirds, Subcoccinella 24-punctata, otherwise known, in English, as the 24-spot ladybird. 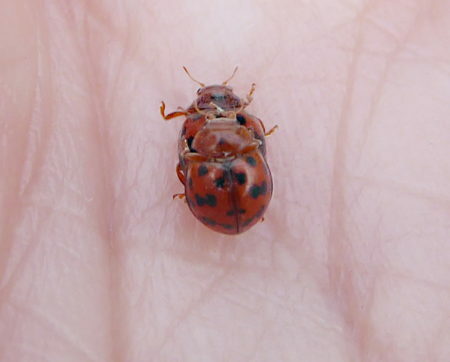 It is a tiny ladybird, much smaller than the “typical” 7-spot ladybird, and without this species rather attractive bright glossy red coat. Part of the reason for the 24 spot’s rather dull red colour is that its body is covered with short dense hairs. As far as I know, it is our only “hairy” ladybird and I have always known it as the “hairy ladybird”. Anyway, whatever it is called, these two don’t seem to be bothered! 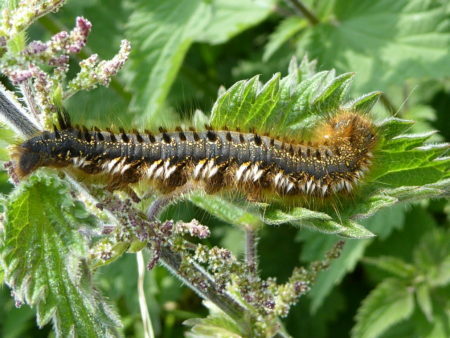 Our next hairy encounter was the Drinker Moth caterpillar. We found several of these walking across the track and on the reeds. It gets its name from the fact that the caterpillar likes to imbibe water droplets (dew) and, apparently, this behaviour has been known for many years. Linnaeus named it Philudoria potataria from the Latin word “pota” meaning “to drink”. Never seen it do this myself, even though this species is common in the north Kent Marshes and I have found them on many occasions. By the way, Sally’s photograph looks like a fake to me. She must have picked up the caterpillar and placed it on some nettles to get a better background. Wrong! It feeds and pupates on Common Reed and the caterpillar was probably very upset being stuck on stinging nettles – hairy or not! Our final hairy moment was finding this Garden Tiger moth caterpillar – known by generations of children as “woolly bears”. It’s long hairs are “urticating” and can cause a rash on people with sensitive skin – the hairs “urt”. Most predators give this species a miss but cuckoos have some way of feeding on hairy caterpillars (how do they do this?). Sadly the population of Garden Tiger moths has declined in recent years so it was really great to see this caterpillar. Thanks to Hazel for organising the coach trip. Thanks to Sally for the photographs. Thanks Malcolm. It’s good to hear about some of the non-bird species too. I’m sure there must have been some hairy plants on the reserve but I can’t think of any right now. Great photos by the way….. I thought that the photos were a bit hairy myself! Gravesend Regatta – your help needed Some News – And Bits and Pieces.